Bob Wandel treats fourth-graders in Jennifer Walters’ class to a history lesson on the Civil War Wednesday at Deerfield School. 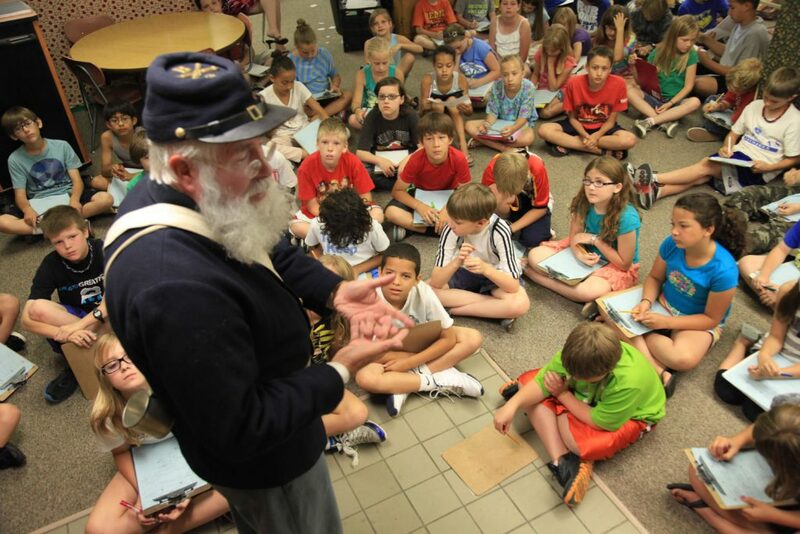 A few days before Memorial Day, Bob Wandel stood before a group of fourth-graders at Deerfield School and shared just why Civil War soldiers should be remembered. “Being a Civil War solider wasn’t easy. It was a tough, tough life,” Wandel said. Dressed in the Union Army’s wool uniform, Wandel had a tin cup hooked to his belt and a canteen slung around his torso. He showed students his fabric sack and explained what soldiers would carry in it. Among the items Wandel listed were pencils and paper for writing home, snacks, gloves and, if the solider was lucky, a toothbrush. “Not everyone had a toothbrush. Sometimes there was just one toothbrush in the family,” Wandel said. It was a concept that drew lots of “eeews” from the group of about 75 students. Each year, fourth-graders study different regions of the country. To tie the North and Southeast regions together, the class learns about the Civil War, said teacher Jennifer Walters, who is Wandel’s daughter. In full costume and white beard, Wandel helped bring the war to life. On Wednesday, he showed students the markings on his blue Union cap that indicated he was part of the cannon crew. He explained that the heavy wool uniforms were hot but necessary because they didn’t catch on fire as easily as other materials. Soldiers slept in tents and on the ground with just a blanket for comfort, he shared. And, in the spring, the soldiers marched in mud, carrying along pounds of muck as they went. They would get just one pair of shoes a year, which often came apart from use. “They marched long and hard. There were hours of marching,” he said. Wandel is part of the re-enactor group who make up the 3rd Kansas Light Artillery, and he has traveled to the battlegrounds of Gettysburg, Shiloh, Lexington and Wilson’s Creek. “I enjoy the kids and enjoy talking about the Civil War and encouraging them to get into history,” Wandel said. Wandel noted that local residents could honor Civil War soldiers on Memorial Day because several veterans from the war 150 years ago are buried in Lawrence’s Oak Hill Cemetery.